Canopy Electrosmog WIFI for protection from HF electrosmog. HF (cell phone, WLAN…) attenuation of up to 38 dB. Cannot be grounded! Please note: NO protection from electric fields – CANNOT BE GROUNDED! 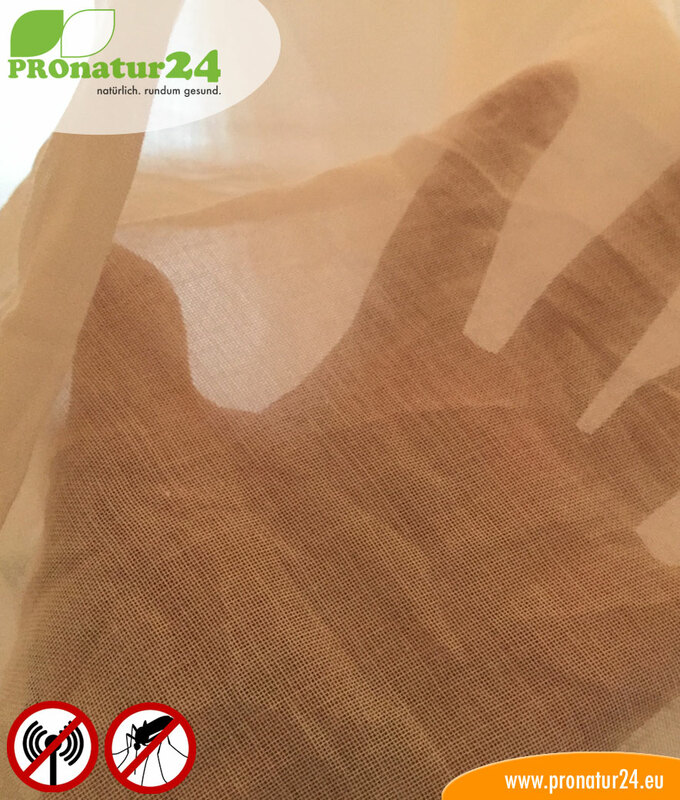 Do you want protection from electrosmog for a healthy sleep? 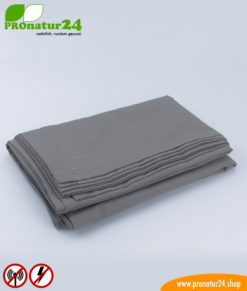 Is sleeping stress-free with high protection from WLAN, mobile radio, mobile Internet, cordless telephones, etc. important to you? And electric fields from the power supply are NOT AN ISSUE in the bedroom? CANOPY ELECTROSMOG WIFI. 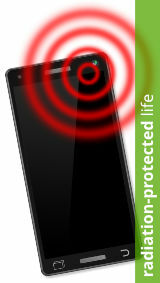 High protection from electrosmog caused by radio radiation from WLAN, cell phones, mobile Internet, and many more. Electric fields from power supply lines or high-voltage lines are often a problem that needs to be solved in the bedroom, but not always. This canopy is definitely great for such a room with no electrosmog from power supply lines (LF). 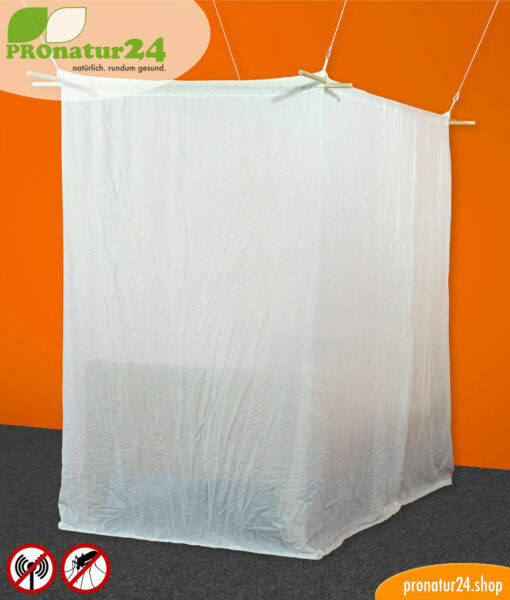 This canopy is made in an appealing, elegant white without any risk of discoloring and shields and lowers the radio pollution from the existing grid extremely effectively to a minimum of high-frequency pulse electrosmog. But why such a canopy? WLAN can easily be switched off at night. The same applies to mobile phones with airplane mode or to the DECT cordless telephone when using the ECO-DECT and Modus. When the neighbors’ WLAN disturbs your sleep! But what about the whole Wireless LAN network from the neighborhood? Most of the time, they remain active during the night while you sleep, and as long as there is no sleep mode, they constantly radiate electromagnetic waves from high-frequency radio. In residential buildings, there are usually several WLANs and not just one. Nevertheless, radiation from WLAN is only a small issue and the only one that can easily be recognized. Electromagnetic radiation from mobile Internet (LTE Cube), active cell phones and smartphones, DECT cordless telephones, or even Powerline, are considerably stronger than the classic WLAN and aren’t so easy to recognize if a suitable measuring device is available. 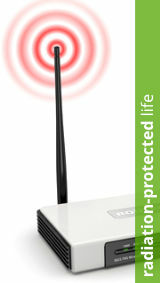 active protection from LTE, UMTS, HSDPA, 3G, GSM, EDGE, etc. This Electrosmog WIFI canopy helps extremely well with HF electrosmog, apart from the impossibility of grounding it. Because radio can only be protected from through reflection, the desire to sleep without WLAN and mobile radio is within reach – all you have to do is take hold of it. 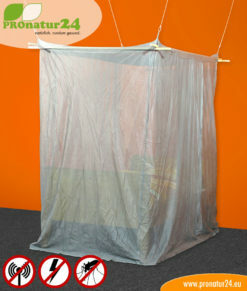 + integrated mosquito net against midges! Protection from midges is just a side effect, but a significant one. We all know these pats that cling to their victims at night – sleeping children, women or men. This is also a hot topic during the summer. Closing the window, even though it helps against midges, ensures you to feel heat exhaustion, and chemical mace is still raises questions concerning health. We have tips for a healthy sleep in the summer, even though the topic of mosquitoes was a concern – until now. This canopy is simply great, it combines everything into one – protection from electrosmog and annoying midges and mosquitoes for a healthy sleep. 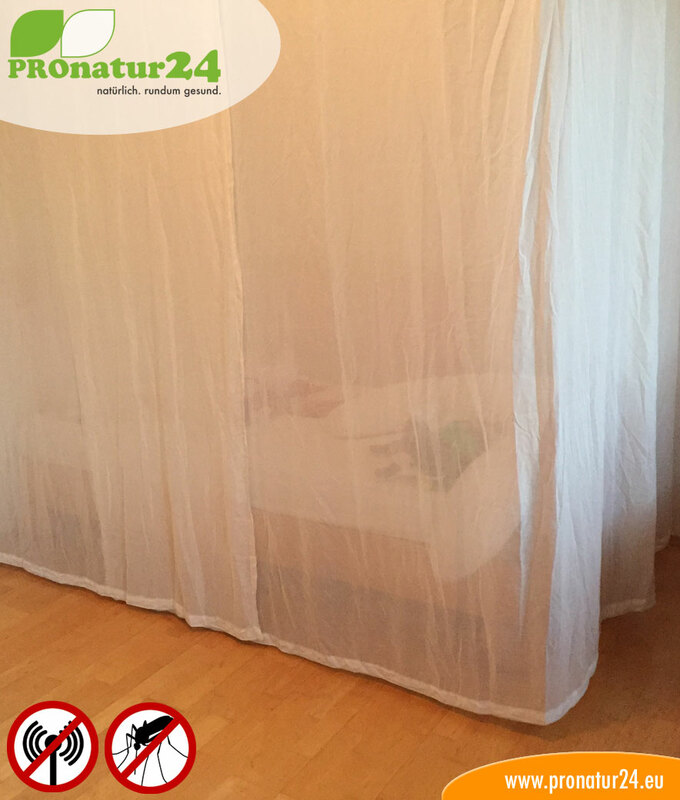 Canopies, a great thing for sleep, but be careful, they are not suitable for everyone! Our practice in the last few years has shown us two significant situations that, mainly for financial reasons, decide the type of technical shielding – RENT OR PROPERTY. There’s no way around it, functioning shielding technology costs money – not an asset, but still noticeable. Euros should not play a part as far as health is concerned, but it is important to think about how much shielding can cost in a flat, especially when it cannot be taken with you. This aspect was our motivation. 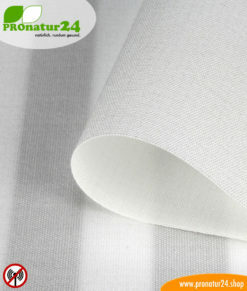 To create an equal and mobile alternative to the static, high-quality shielding. 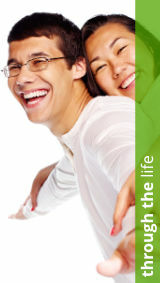 The highest protection possible for tenants that is mobile and can easily be taken to the next residence. If I am the owner of the building or, in other words, of the residence or house, the priority in our eyes lies in the rehabilitation of the room with shielding paints, meshes, and curtains to create an invisible but highly-effective Faraday cage. It is and remains the best form of shielding, and owning one is ultimately a significant upgrade on the building. Canopy – the solution for tenants who wanted to be protected from electrosmog. The classic tenant was at a disadvantage up until now. The assumption of costs by the landlord can only be seen as a success and consequently, rehabilitating the room is often impossible for financial reasons. With this canopy that protects from electrosmog caused by radio, we now have a true alternative for the first time. When moving, simply pack the canopy and set it up again in the new residence – that’s it, the investment and effect survive. Simply great! And it is actually a lot better – our measurements have clearly shown this. With the full program of this canopy, the countless WLANs from your neighbors, DECT, cordless telephones, LTE, smartphones, and mobile Internet become minor matters. Even if you can now theoretically leave your phone on the night table, we recommend keeping the airplane mode on – not so much against the radiation but more against acoustic signals from e-mails, SMS, Facebook, WhatsApp or other active apps that will lower the quality of your sleep. The goal is to lower the electromagnetic radio pollution to under 100 µV. Ideally, it even wants to be under 30 µV! A box-shaped canopy offers a spacious feel to the room. Two lateral overlapping entries. Making the bed is easy without having to move the canopy. Drawback: Cannot be hung onto sloping rooves. 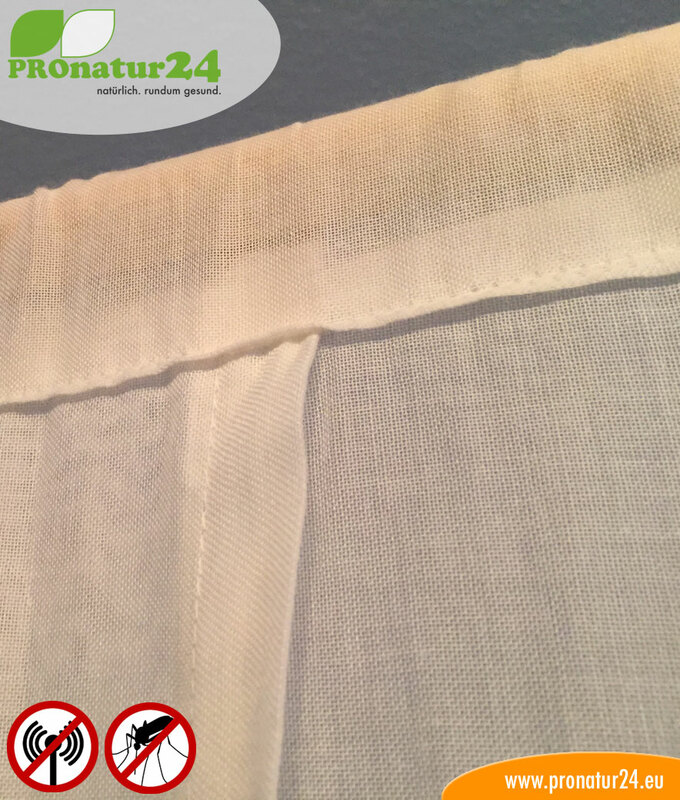 All measurements depend on the fabric with +/- 10 % tolerance! 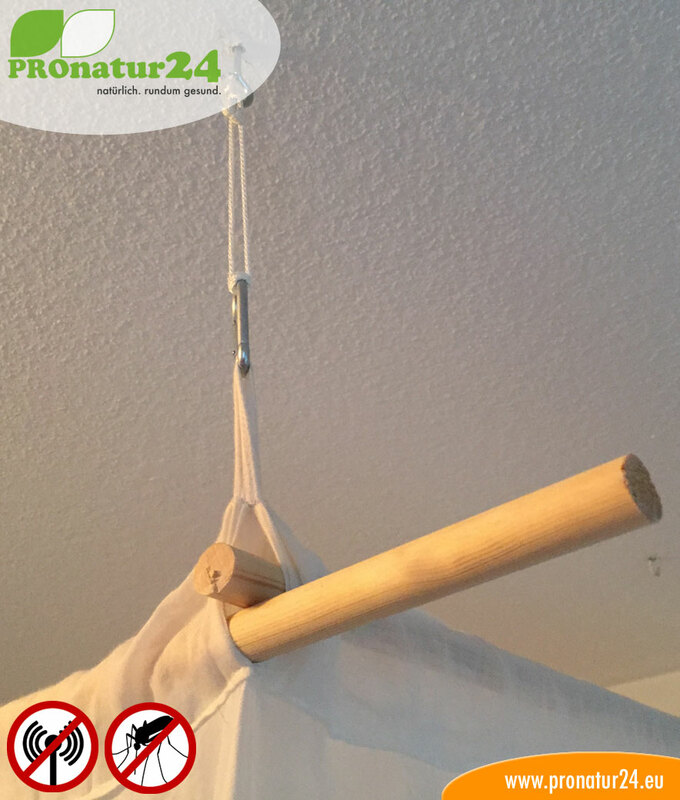 Mounting: Hang to four points of the ceiling. 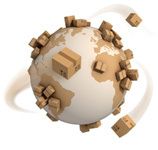 To stabilize the box shape, poles (do not come with the delivery) can be slid in to the flaps sewn above. Scope of delivery: Canopy, fixing material. A pyramid makes sense if you want to hang it up quickly or if there is a sloping roof. Only suitable and sensible for single beds up to 100 cm in width because otherwise, the slope will be too big. 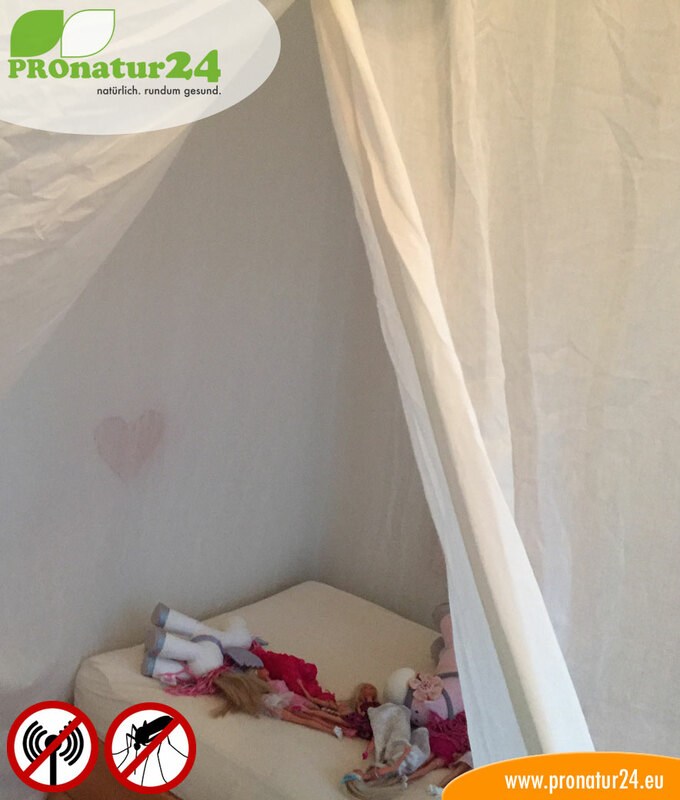 The pyramid canopy has a significant drawback: the canopy only offers limited space, therefore “making the bed” is only possible after moving it. This constant movement of the fabric leads to a shortened lifespan of the Silver Tulle shielding fabric’s maximum screening effectiveness and therefore of that of the canopy. All of our canopies are NEW ITEMS. If a canopy is returned, we are forced to offer it as a used item for a lower price. 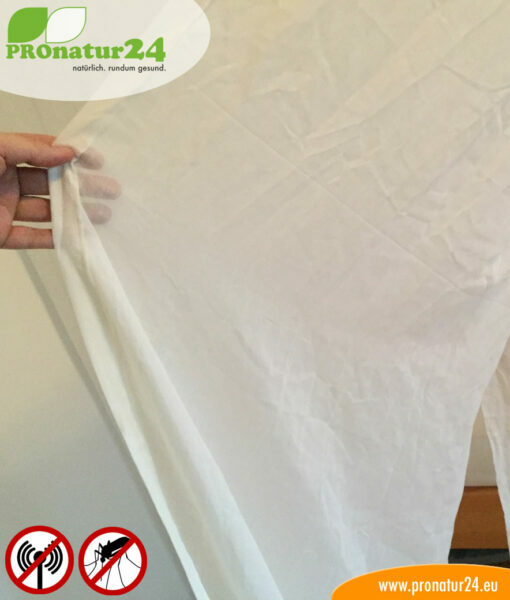 In order to prevent this, we offer the possibility of borrowing the canopy for up to 14 days for a lump sum of €250. 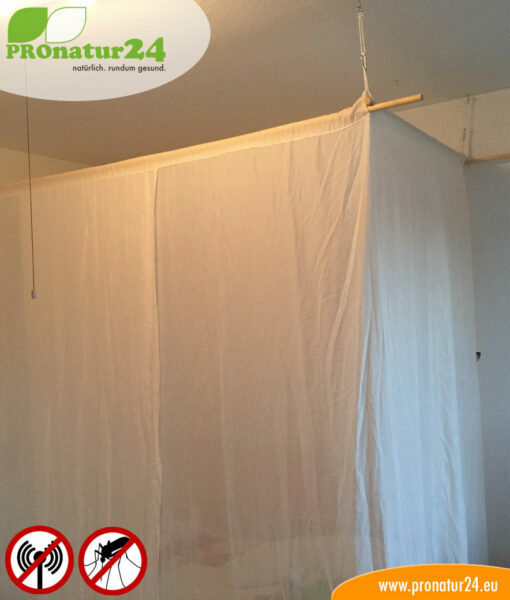 If the canopy is then bought, the rental price is paid for and taken off the purchase price. It is not possible to cancel orders because of this option of borrowing the canopy. High shielding performance thanks to the shielding fabric NATURELL! Screening attenuation All attenuation values apply for 1 GHz. Measurement following the ASTM D4935-10 / IEEE Std 299-2006 / IEEEE Std 1128-1998 / ASTM A698/A698M-07. 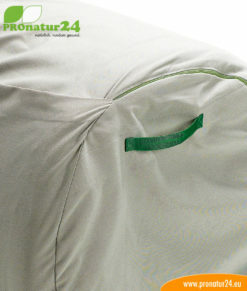 Naturell shielding fabric Eco cotton fabric by Swiss Shield® with high shielding effectiveness. Disadvantage: Because of medium-thick threads, the light and air permeability are limited, but still acceptable. Attenuation: 38 dB at 1 GHz. Cannot be grounded. 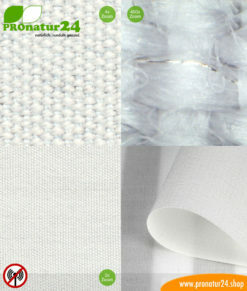 SILVER SILK shielding fabric for cell phone cases, RFID NFC data protection, the inside of clothing, etc. Up to 60 dB HF attenuation, can be grounded for LF protection. Canopy Electrosmog PRO for protection from electrosmog! HF (cell phone, WLAN…) attenuation of up to 50 dB and can be grounded to LF electric fields (power supply)! SHIELDING TEST PATTERN – up to 3 samples for free!